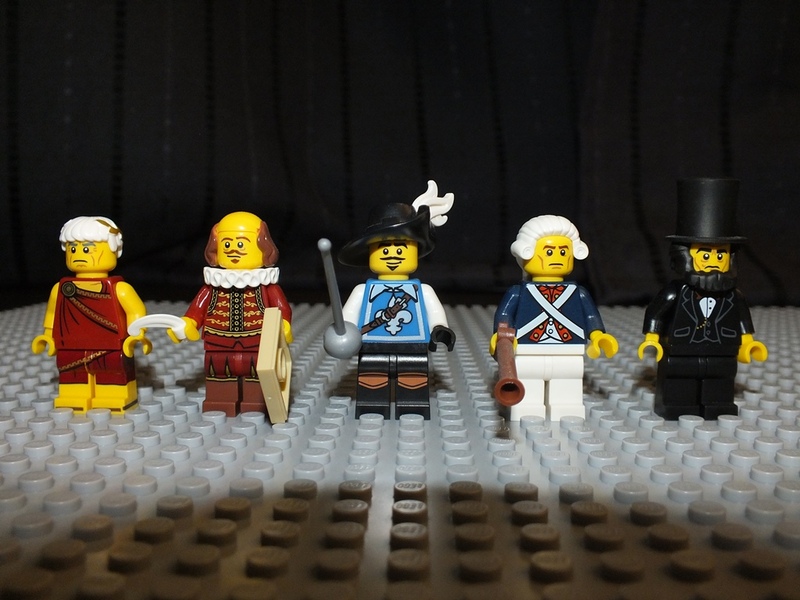 I recently realized (after buying some minifigures from the Lego Movie) that Lego has released some historical people in its Minifigures Series. And I realized that I owned a few of them. Now, most of them are not labelled as such, for some reason, but they’re usually pretty obvious. Actually I wonder why some figures are only named as a generic term. It’s not like they’re characters and their rights are owned by someone else (at least I hope they’re not). From left to right: Julius Caesar, William Shakespeare, Charles de Batz-Castelmore d’Artagnan, George Washington and Abraham Lincoln. I’m not sure if there are more around. There definitely is a Cleopatra lookalike, and while we can’t call them “historical figures” there is also a Marilyn Monroe and a “trendsetter” which reminds us of the infamous Paris Hilton. Apparently there is also a Blackbeard from the Pirate of the Caribbean series. Am I missing some? Now, I admit, D’Artagnan could be any musketeer, and Washington could be any American Revolutionary Soldier (even Caesar could be many Roman Emperor, not necessarily Julius – actually Julius never was Emperor), but still, I like it better to think they are the actual historical figures.